Download this app to obtain Statutes and Case Law relating to the Fair Debt Collection Practices Act, the Fair Credit Reporting Act, the Telephone Consumer Protection Act, and the Consumer Financial Protection Bureau. If you’d like to see additional features or content, please be sure to send your feedback! Check out the ARM LAW™ App from Bedard Law Group, now available on iTunes, Amazon and Google Play. Bedard Law Group has exciting news! We are pleased to report that our firm has joined forces with Ontario Systems to develop and deliver a comprehensive compliance auditing service focused on your CFPB preparedness. This service will identify gaps and risk in your operation (Phase I), test your current compliance systems (Phase II), and deliver continuous improvement and readiness guidance going forward (Phase III). The three Phases of this service are independent. You choose the Phases that best meet your needs. These services are available even if you do not use Ontario Systems software products. Unlike other auditing products in the industry today with price tags of $30,000+, our CFPB Consulting Services delivers superior value at half the cost. Our CFPB Consulting Services are tailored to your specific needs, on your timeline and within your budget. For more information on these auditing services, please view our CFPB Consulting Services Brochure. If you are thinking about CFPB preparedness, please contact me to discuss how Ontario Systems and Bedard Law Group, P.C. can help. Ronald S. Canter, Esq. and John H. Bedard, Jr., Esq. 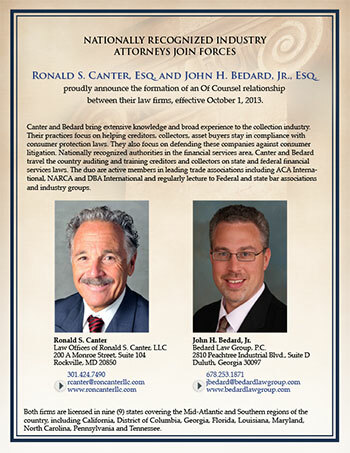 proudly announce the formation of an Of Counsel relationship between their law firms, effective October 1, 2013. View the PDF to read the entire article. Please Read the Terms of Your Use of this Website.